snowdeal.org > ex machina: things you do when your industrious brother-in-law visits. things you do when your industrious brother-in-law visits. 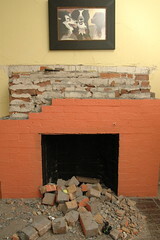 "hey, you think we can take out the fireplace? i mean, how hard can it be?" and no, we didn't paint it orange.